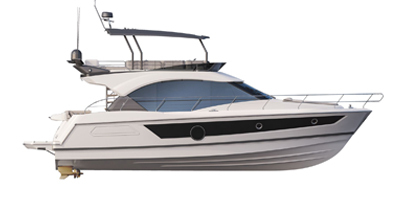 The Antares 23 has a new flared-out hull that delivers wonderful driving sensations, while boasting excellent seakeeping. The dynamic V design of the cap clearly announces the boat’s stunning aesthetic design. Its clever deck plan offers three different possible cockpit seat layouts. Designed to make living on board a real pleasure, the Antares 23’s exterior and interior fittings make coastal cruising feel like a long-distance cruise. The Antares 23 is fitted with a Mercury engine and enjoys a propulsion power of up to 200 hp. Small galley: 11 US Gal icebox (option refrigeration), sink, place for hob. U-shaped saloon seating 4 people. Converts into double berth (6'6''x 3'3'').